Falcone’s Locksmithing is a Desert Hot Springs locksmith. With years of experience, we are able to assist with everything from Residential lock service to Commercial and Safe locksmith services. We are a licensed locksmith! If you find yourself locked out of your home or office, call us. We can even help with key duplication, lock rekeying and much more. 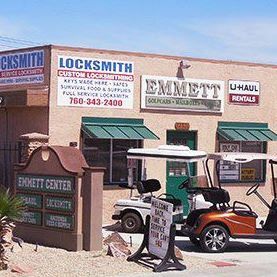 You can visit our lock shop located at 15300 Palm Drive in Desert Hot Springs, CA 92240 or just give us a call at 760-343-2400.